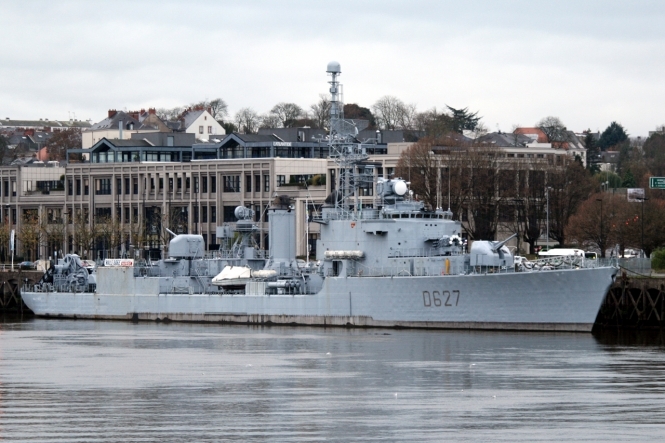 The French navy ship the Maillé-Brézé is celebrating 30 years of being moored up at the Fosse port of Nantes (Pays de la Loire), with a festival in its honour taking place this weekend. The ship - which now operates as a floating naval museum - has been moored up at the quayside since 1988, when it was decommissioned from the navy. The ship was classed as a historic monument on October 28, 1991 - only the third navy ship to receive the honour - and now acts as an unusual location for conferences, meetings, historical events and even as a filming location for Hollywood movies. Now, a festival in honour of the ship is taking place in Nantes, lighting up the vessel after sunset for the first time ever (it normally falls into darkness overnight), and welcoming residents to rediscover the ship’s history. Mayor of Nantes, Johanna Roland, opened the conference to celebrate the ship’s 30 years on Friday (June 8), kicking off a series of activities, video games and live music events on the quayside throughout this weekend. Today (Sunday June 10), the ship itself will be open to visitors from 14h to 17h30. Numbered as the D627 (D for “destroyer”), the ship originally joined the French naval fleet in 1957, and was one of 18 to be created after the Second World War. Its name comes from Jean Armand de Maillé - marquis of Brézé and nephew of Cardinal Richelieu - who lived from 1618 to 1646. De Maillé was a grand Admiral of France by age 24, and was credited as key to a number of French naval victories, before his death aged just 27. Named in his honour, the Maillé-Brézé started life as an anti-aircraft vessel, but was later altered to become an anti-submarine ship, with sonar trackers and other underwater tools installed. Despite having many weapons on board - including anti-aircraft guns - the ship never once fired or attacked an enemy vessel or plane in all its years on the water. In its heyday, it would have carried up to 277 navy personnel, but can now no longer sail unaided due to all of its weaponry and propellers having been removed. And while the ship is recognised to have been moored in Nantes for 30 years overall, it has spent some time away from the quayside, most notably as an impressive backdrop in the recent cinema blockbuster Dunkirk, by director Christopher Nolan. The ship also acts as a conference and meeting space, and has even been the location for an “escape game” - an immersive game that asks players to solve riddles and clues in real-time to allow them to “escape” the ship. Explaining the concept, Mr Guillet said: “We worked with a [local] company to develop a scenario for the game, set during the Cold War. We changed the boat round to accommodate the game, and did a test with 1,500 players over two days. It was a huge success and allowed us to attract younger members of the public.